It's an awesome time to be a Marvel fan. Not only are there awesome things happening in the MCU, but Marvel is also releasing a brand new animated franchise that we are so incredibly excited about. This multi-platform franchise, Marvel Rising: Secret Warriors, features a new group of heroes that are coming into their own and trying to show the types of heroes they can really be. This year, six four-minute shorts will be released to explain the world of Marvel Rising. Later on in 2018, the feature-length animated film, Marvel Rising: Secret Warriors will be released. This is a big, exciting new world that is being built in Marvel Rising, so it's time to learn the heroes that you'll be rooting for. We've got an exclusive look at each hero and the actors who will be bringing these awesome characters to life. This is a rad lineup of well-loved, diverse, and dynamic characters, and we're so excited to see this team in action! Rough turns for animation development only - all final poses will be revealed at a later date. Gwen Stacy will be voiced by Dove Cameron (Hairspray Live, Descendants), and is a free-spirited teen who became a superhero after she was bitten by a radioactive spider that gave her superpowers. She's dedicated to helping those in need as her alter-ego, Ghost-Spider, but she has to be careful and keep that part of her life a secret from her father, Captain George Stacy, who believes Ghost-Spider is more of a menace than an ally. Fans of Agents of S.H.I.E.L.D. will be excited about this one. Daisy Johnson, a.k.a. Quake, will be voiced by her live-action counterpart from Agents of S.H.I.E.L.D., Chloe Bennet. In Marvel Rising, Daisy will be a S.H.I.E.L.D. agent who has a tendency to break the rules--something that most definitely gets her into trouble. A top agent at S.H.I.E.L.D. and is able to produce vibrational waves that feel like earthquakes, Daisy is able to come into her own as a leader when she meets the group of young heroes who teach her what good leadership is all about. Dante will be voiced by Tyler Posey (Teen Wolf), and is a brooding loner on the run. Though Dante is armed with the powers of pyrokinesis, he's not fully able to control the flames he can generate. His unpredictable moods and abilities have Dante walking that thin line between hero and villain pretty regularly. Kamala Khan will be voiced by Kathreen Khavari (Marvel’s Avengers Assemble, Big Little Lies). Kamala is already a well-loved character from the groundbreaking G. Willow Wilson comic, and in Marvel Rising, Kamala will be working hard to prove that she's a capable superhero. A diehard superhero fan herself (especially of her fave, Captain Marvel), Kamala uses her metamorphic powers that let her stretch, enlarge, or shrink herself to fight evil and help those in need. Voiced by Milana Vanytrub (Marvel's New Warriors and This Is Us), Doreen is the hilarious, super-positive best friend of Ms. Marvel. She's got advanced computer skills, agility, durability, and the senses of a squirrel, and she's ready to be the hero we all deserve. Plus, with her trusty squirrel companion Tippy Toe by her side, she can't be stopped! America Chavez is a strong, independent young hero. Though her painful past has led her to reject leadership and be somewhat of a loner, she is still driven to do good in the world. And with the help of her powers of superhuman strength, speed, durability, and the ability to fly, she's able to do just that. America will be voiced by Cierra Ramirez (The Fosters, The Secret Life of an America Teenager). Rayshaun (voiced by Kamil McFadden) is a young man who is determined to continue Captain America's legacy of honor, integrity, and order. Striving to impress his colleagues at S.H.I.E.L.D., Rayshaun is a natural leader who is always quick to leap into action. His heightened strength, speed, stamina, and durability help him fight for those in need. Like many of us, Captain Marvel is a huge source of inspiration for our Marvel Rising heroes. Voiced by Kim Raver (Grey's Anatomy, 24), she is a straight-shooter who is led by her strong sense of duty and honor. Captain Marvel has superhuman strength, can fly at high speeds, and can project intense energy blasts, making her not just a great role model, but a great one to have on your team of superheroes. Last but certainly not least are the two animal companions to two of our heroes, Lockjaw and Tippy Toe. Tippy Toe is the squirrel sidekick to Squirrel Girl, and Lockjaw is the giant pupper companion to Ms. Marvel. Both creatures will be voiced by Dee Bradley Baker of Star Wars Rebels and Gravity Falls. If you want to learn more about the characters and the franchise, Marvel released a short video that introduces you a bit more to each character, as well as helps explain the heart behind Marvel Rising. This franchise is stacked with talented actors and is featuring a truly awesome range of Marvel heroes. We are so excited to see what adventures are in store for us with Marvel Rising. 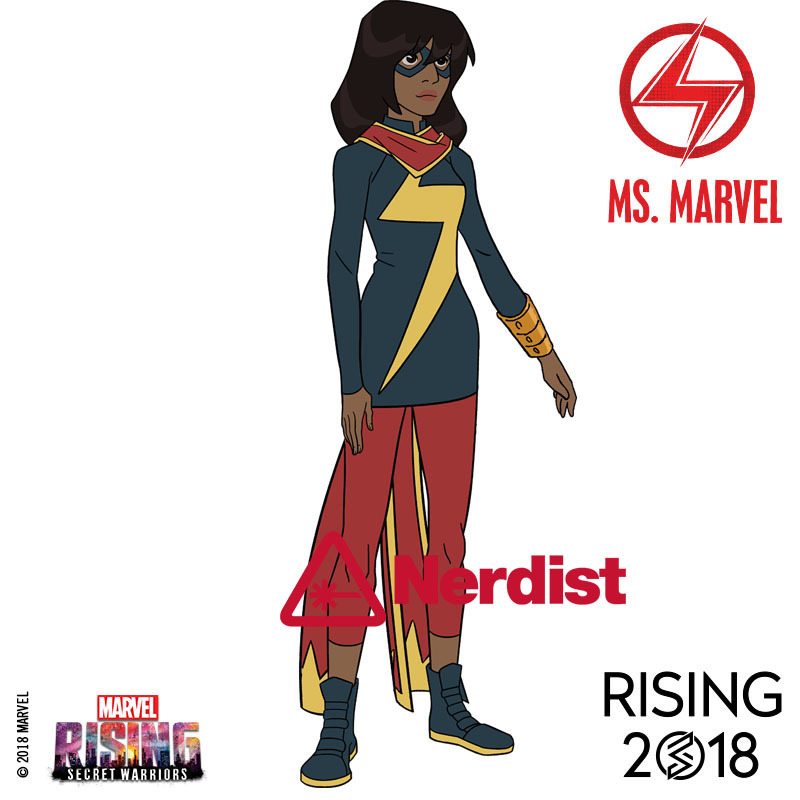 What are you most excited to see in Marvel Rising? Are there any other characters you'd like to see make an appearance in the new franchise? Let's talk about it in the comments! More from the Marvel Universe!